Lava steams after it hit Hawaii's Green Lake, which had been filled with water hours before, on Saturday. Green Lake was gone in hours. Lava from Kilauea volcano spilled across highways and into Hawaii's Green Lake — a major source of freshwater on Hawaii's Big Island — and evaporated all the water, according to the U.S. Geological Survey. 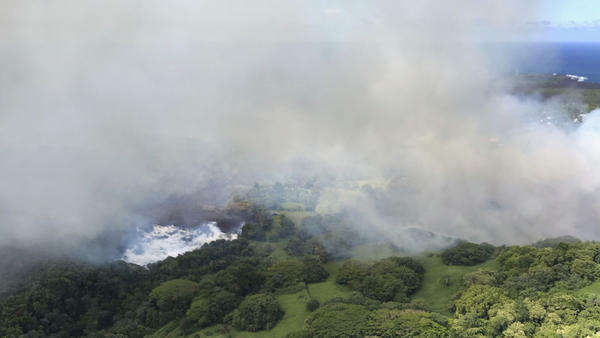 The flow created a huge plume of steam as it hit the lake Saturday on its way toward the ocean, according to Hawaii County Civil Defense agency. "The lava is quite hot, so it boiled away the water," Sally Sennert, a USGS volcanologist embedded at the Smithsonian's Global Volcanism Program, tells NPR. "The lava flows, like a stream of water, are going to take the path of least resistance as they flow downhill," Sennert says, adding that she doubts the lake will return. 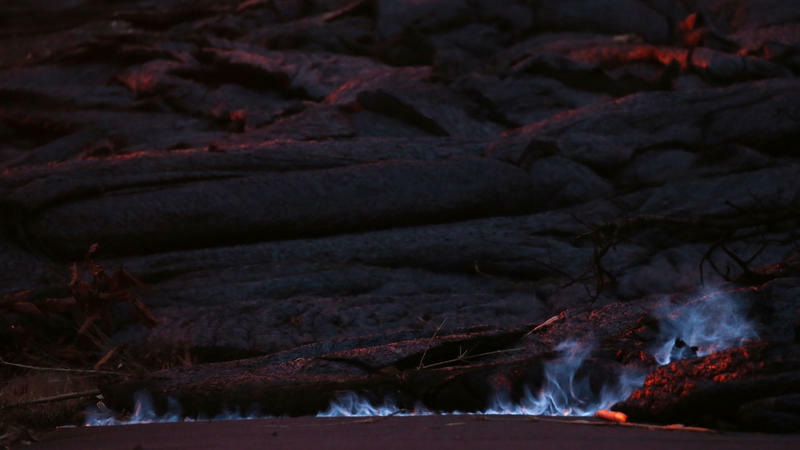 "All I've heard is reports that lava has filled it up," she says. 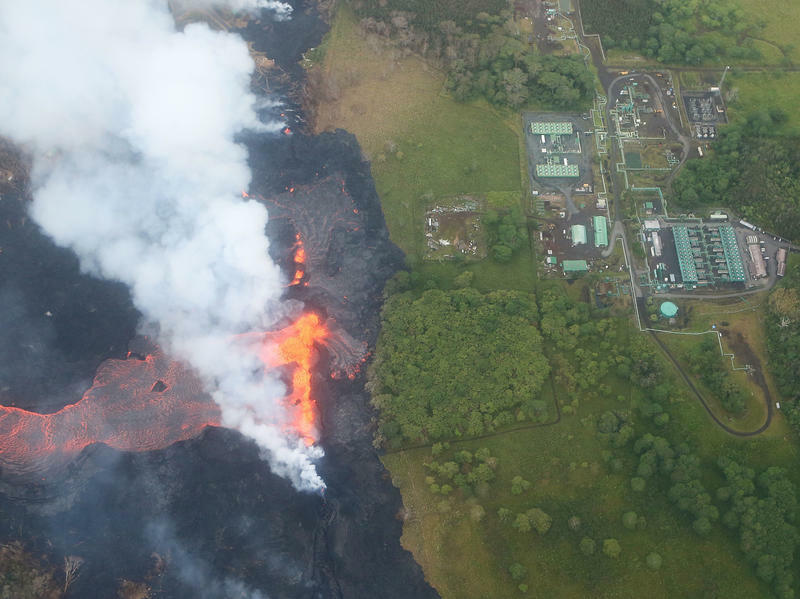 The lava entered Green Lake at 10 a.m. local time and had evaporated all the water by 3 p.m., according to the USGS. Rivers of lava from Kilauea have claimed hundreds of homes and displaced thousands of people since a major eruption more than a month ago. A total of 22 fissures have opened up, according to Hawaii Public Radio. The lava has advanced at 656 yards per hour, the fastest lava flow rate on record, according to the USGS. The agency warns that there are still "vigorous lava eruptions" in the lower East Rift Zone, making the Pacific Ocean dangerous to enter in that area. Lava flowing into the ocean can cause explosions, propel rocks and create plumes of "laze," which Hawaii County officials describe as hydrochloric acid and steam with fine glass particles. Laze can damage the lungs and irritate skin and eyes. 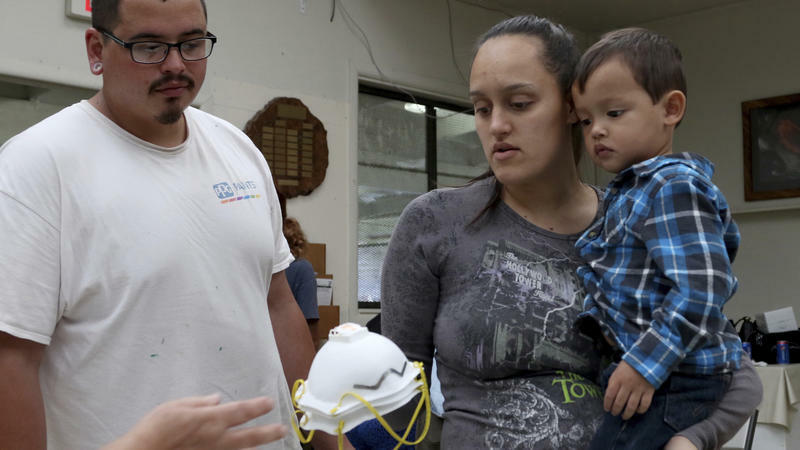 On Wednesday, Talmadge Magno, Hawaii County's civil defense administrator, said 410 people were living in shelters and that a residential area had been destroyed. "Vacationland is totally gone," he said. "It's covered by lava." Magno said a flight restriction has been placed to prevent drones from interfering with rescue efforts. "We've had some pretty serious encounters with our county helicopter," he said. "One of those drones in the tail rotor or your main rotor could take that helicopter down." Just after 4 a.m. local time Thursday an explosion within Kilauea's Halemaumau crater on the island of Hawaii produced a volcanic cloud reaching as high as 30,000 feet, according to the U.S. Geological Survey . Ballistic blocks, earthquakes and ocean plumes: In the three weeks since Hawaii's Kilauea began erupting, it has produced some awe-inspiring — and dangerous — phenomena. 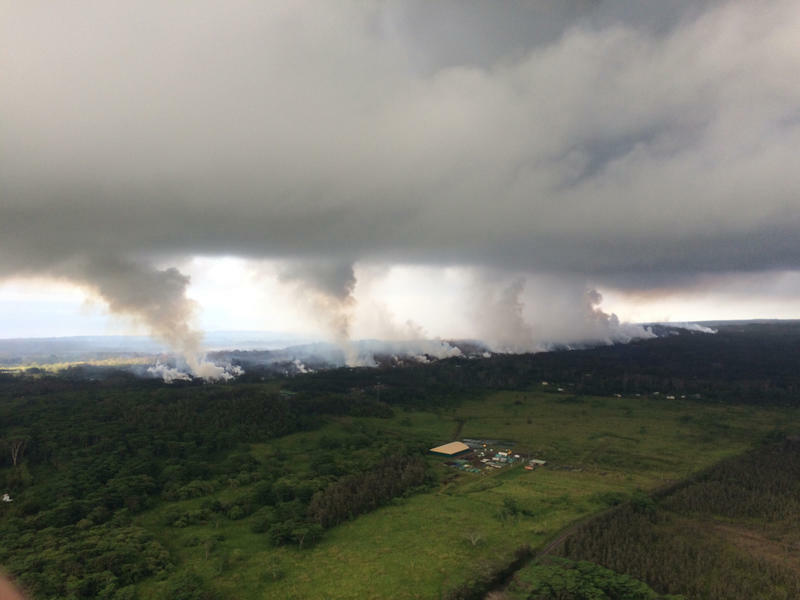 The new fissure was discovered at Leilani Estates, the neighborhood in Puna where the first new fissures were seen this month when Kilauea suddenly became more active. Since then, more than two dozen homes have been inundated in slow-moving lava flows.